While most of us don’t trust journalists, many of us are still under the illusion that we have a free and independent press. Here’s five reasons why we should be very sceptical of the information we read in the corporate media and why there is hope for the future. True editorial independence often doesn’t exist in these papers. The owners can – and do – interfere with what is published in their publications, which editors and journalists are promoted or fired as well as which political parties the paper supports. During the Leveson inquiry, when asked about this, Murdoch was also reminded he had previously said, “If you want to judge my thinking, look at the Sun.” Murdoch admitted that frequent phone calls happened between the editors and him, although as Yelland shows, the influence of Murdoch could also be more subtle, with editors internalising his values and opinions. Even The Guardian is compromised, although not as much as other national media companies. 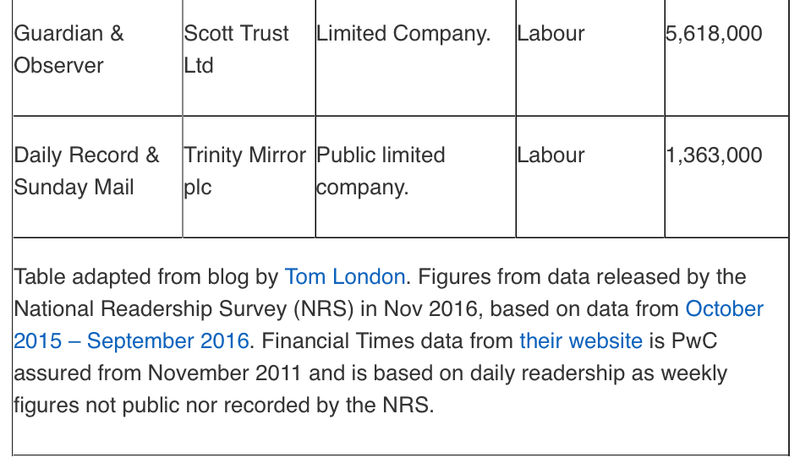 The Scott Trust Limited, which owns The Guardian, is wholly owned by the company directors who are prohibited from taking any dividends. The Guardian also claims to be guided by a range of progressive values, including the task of maintaining its editorial independence. 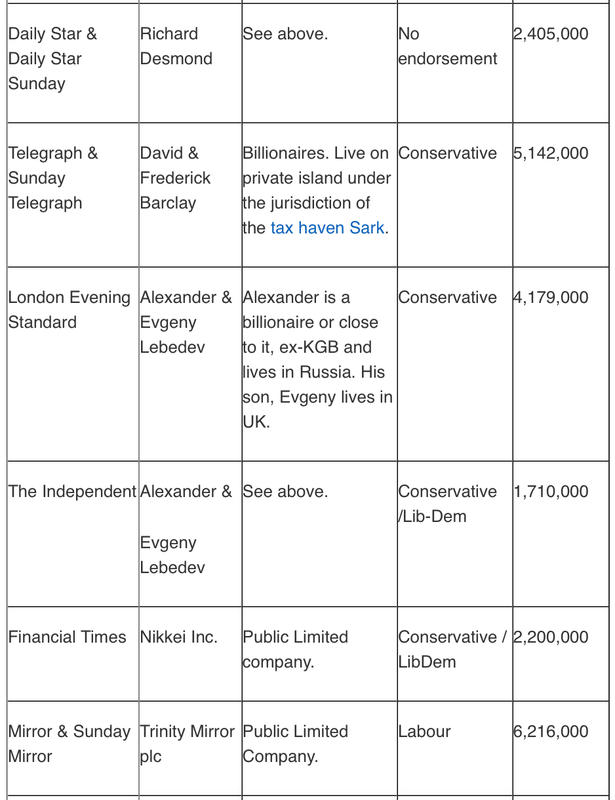 However, as Nafeez Ahmed points out in Insurge Intelligence, some members of its board are ex-financiers – binding the Guardian into Britain’s murky financial world in a way which may surprise many of its readers. 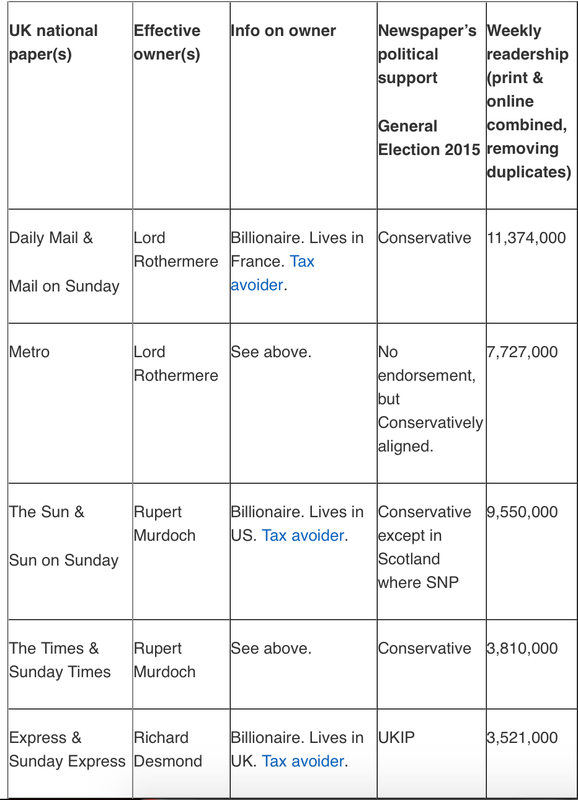 With six billionaires as majority voting shareholders for most of the UK national newspapers, it is unsurprising that they mostly supported the Conservatives in the last general election. The Conservatives reduced the top tax rate, and want to reduce it further, giving millionaires and billionaires massive tax breaks. Under the current media ownership structure, how much hope is there of genuine progressive agendas to reduce wealth, income and power inequality that also threatens the interests of the billionaires and companies that own the press? Noam Chomsky and Edward Herman give many more examples of this here. How often do we read articles in newspapers critiquing capitalism, let alone corporate capitalism? Just imagine what would happen to a newspaper’s advertising revenue if it consistently critiqued corporate capitalism. Just think what else is excluded from the press because it would seriously challenge corporate advertisers. There are different studies showing the dominance of a private-school and Oxbridge educated elite at the top of UK journalism, and the trend has been getting worse. The recent Social Mobility and Child Poverty study found out that nearly half of UK national newspaper columnists graduated from Oxford or Cambridge (as opposed to less than 1 per cent of the population) and that 54 per cent of the nation’s “top 100 media professionals” attended private schools (compared to around 7 per cent of the population). “Only 25 per cent of the population earns more than £30,000 a year. Most media commentators (including me) do. For people like me, the country basically works. Politics doesn’t affect me. Politics, for me, is about how other people are treated. It’s easy inside my echo-chamber to believe that I am the norm, or the middle. Easy to forget that there are voices outside. It is not just private and Oxbridge education which dominates the media. Due to the under-representation of Black, Asian and minority ethnic (BAME) journalists, as well as the frequent racist portrayal of BAME people in the media, Media Diversified was set up to try and combat this. Women are also heavily under-represented, both in journalists employed but also in the amount of coverage received. Research on the UK media by Professor Lis Howell found that between April 2014 and September 2015 the number of male experts interviewed on flagship news programmes outnumbered female experts by 3.16: 1, with ITV News at 10 having 4.9 male experts for every woman. In previous research, Prof Howell also found ten times as many UK male politicians featured on the news as female politicians. Research by Women in Journalism and others in 2012 also found that men dominated news stories in a wide range of ways, such as front page stories being about or written by men around 80 per cent of the time. Even if they wanted to, these privileged and predominantly white, male, privately educated, Oxbridge graduates often can’t truly understand, let alone accurately represent in the media, the situations and choices faced by most people as they are outside their own life experiences. How many have strong links with working class communities? How many of these influential journalists have been long-term unemployed, on low incomes, on benefits or tax credits, with long-term health conditions or have faced racism or sexism? How many fall back into repeating ideas to each other within the “echo-chamber” of the privately and/or Oxbridge educated, while falsely believing they are in the “muddled middle”? The sources which are used by journalists and the range of debate published within the UK media can show us another way in which the corporate media is deeply compromised. There have been academic studies proving that systemic bias exists in how the media covers events. Three events can be used as examples – the Scottish referendum, the 2008 financial crisis and the second Iraq war. A team of academics studied the coverage of the Scottish independence referendum between 17 September 2012 and 18 September 2013, looking at 730 hours of evening TV news output broadcast by BBC 1, Reporting Scotland, ITV and Scottish TV (STV), and found them all to be biased against Scottish independence. As Professor Robertson of the University of the West of Scotland (UWS) has outlined, anti-independence statements were aired over pro-independence statements at a ratio of around 3:2 on most channels. The research also showed a clear tendency to use anti-independence over pro-independence ‘expert’ sources, including from organisations presented as independent and/or impartial despite their linkages to UK government departments with a vested interest in maintaining the union. After Robertson’s research was published it was stonewalled and mostly unreported by the BBC. The BBC then went above Robertson’s head to his Principal at the UWS to try (unsuccessfully) to discredit the research and colleagues of his were even warned to “stay away” from him! Robertson followed up this research with a one-month intensive study of BBC Scotland’s extended ‘flagship’ politics show, Good Morning Scotland, which found similar bias around the independence campaign. Other studies of the media have found similar results of bias in relation to the financial crisis. Dr Mike Berry, of Cardiff University, authored such a study – The Today programme and the banking crisis (not open access). The table below, from the study, shows the sources featured during the intense six weeks of coverage on the BBC’s Today programme following the collapse of Lehman Brothers in 2008. Considering the impact of the financial crisis on the UK workforce, and that trade unions represent the largest mass democratic organisations in civil society, such invisibility shows the BBC is not truly committed to impartial and balanced coverage. This kind of reporting increases the likelihood of war and state oppression. A 2013 UK ComRes poll – which was almost entirely ignored by the media when it was published – showed how the media had completely failed to educate the population about the devastating human death toll of the war. Most people vastly underestimated how many people died in the Iraq war, with two-thirds (66 per cent) of the public estimating that 20,000 or fewer civilians and combatants died as a consequence of the war in Iraq since 2003, with around 40 per cent thinking 5,000 or less had died. “If we believe the results, then war-makers in government will take great comfort, as will the generals who work so hard to peddle the lie of bloodless warfare, with all the cockpit video propaganda video news releases and talk of “collateral damage” instead of “dead children”. Keeble has given many more examples in his book chapter of the intelligence services infiltrating the media and changing the politics of the time, including around the miners strikes and Arthur Scargill in the 1980s and during the lead up to the Iraq war in 2003. The recent revelations by former CIA employee Edward Snowden showed the extent of co-ordination between the spy agencies of the UK and America – especially between GCHQ and the NSA. They showed, for example, that western intelligence agencies attempt to manipulate and control online discourse with various tactics of deception and reputation-destruction. • And “the most malicious form”: they plant intelligence agency propaganda stories on willing journalists who disguise their origin from readers. While we will never know the true extent of secret service influence on the media, there is no doubt that it does happen. And while some BBC correspondents may think that “we’re all on the same side” and that it doesn’t matter if MI5 and MI6 sometimes peddle disinformation, the truth is that it can sometimes have disastrous consequences, such as making war much more likely. The recent Iraq war showed us that the secret services are not always acting in the public interest. Our media system is deeply compromised. However there is some hope for the future as ideas not normally in the corporate media are increasingly being distributed through other channels – especially through the internet, alternative media and media co-operatives. Alternative media such as openDemocracy, Indymedia, Democracy Now and Red Pepper have existed for years, while The Canary was launched online a year ago. There has also been a resurgence of co-operatively owned media after some failed experiments in the 1970s, with The New Internationalist (now apparently the UK’s oldest workers’ co-operative) still surviving from that period. These media co-operatives are either owned by their workers, their readers or both as multi-stakeholder co-operatives. Corporate Watch and Strike! Magazine – both workers’ co-operatives – have been running since 1996 and 2012 respectively. The Morning Star has been a reader owned co-operative for several years. Ethical Consumer converted into a multi-stakeholder co-operative in 2008. The Bristol Cable has recently been created by local residents as a co-operative. Positive News has recently been crowdfunded by its readers to be a co-operative. STIR magazine is planning to transition to a co-operative structure. In the UK the co-operative movement founded their own publication in 1871 to report on the co-operative movement – the Co-operative Press – which continues as Co-operative News to this day. 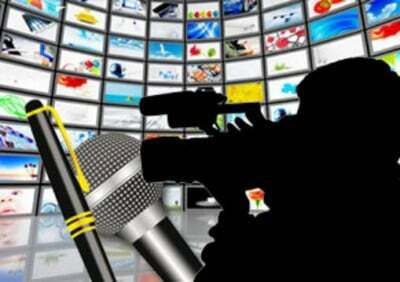 There has been a surge in Scottish alternative and co-operative media. The West Highland Free Press was bought out by its employees in 2009. Bella Caledonia emerged before the Scottish referendum, and after it The Ferret was crowdfunded to pursue investigative journalism as a co-operative owned by its subscribers and journalists, and Common Space was established as a crowd-funded rolling news service. There have also been efforts to support investigative journalism. Websites such as Patreon enable readers to support investigative journalists directly. The Bureau for Investigative Journalism also funds and supports investigative journalism. Wikileaks has also provided a very valuable resource for journalists trying to investigate what is actually going on. Globally, there are many more examples of alternative and co-operative media. The Media Co-op is a network of local multi-stakeholder media co-operatives providing grassroots, democratic coverage of Canadian communities. The Real News is a non-profit, viewer-supported daily video-news and documentary service based in the United States. ZNet is a viewer supported alternative media outlet based in the US. Critical perspectives on the media appear with MediaLens, Spinwatch, Off Guardian and BS News in the UK as well as FAIR and many others in the US. However, alternative media does vary in quality. As has been much discussed since Donald Trump’s election, alternative (as well as corporate) media can be fake, far-right and/or not sufficiently fact-checked. Only if alternative/co-operative/investigative journalism is financially supported by its readers will they be able to research and write high quality articles. Together we have immense resources and power to support non-corporate media if we choose to. The Media Fund – which itself will be a multi-stakeholder co-operative – recentlycrowdfunded £10,000 to support the UK’s media revolution, but much more is needed to ensure its success. Other information sources (Twitter, Facebook, YouTube) – which although are corporations themselves – provide access to different viewpoints, but they can also create bubbles where people with similar beliefs follow each other and they can be compromised and censored by the corporations themselves (censorship of Twitter, Facebook and YouTube exists, including of large numbers of Palestinian posts, pages and accounts). There are also dangers with the idea that everything we say should be connected to a personal profile – there are real benefits to anonymity as shown by the countless people in prison or facing trial in the Middle East for their posts on corporate social media. Ideally, for alternative media to be truly successful, we need to create alternatives to Facebook and Twitter that are open source, collectively owned and which allow anonymity if desired. As the internet generation gets older, and hopefully less exclusively reliant on the corporate media, maybe things will continue to change. Despite relentless aggressive attacks by the corporate media against Jeremy Corbyn, which unmasked supposedly left-wing newspapers like the Guardian which three academic studies have recently confirmed, he managed to win two Labour leadership elections by a landslide. A poll of those eligible to vote for Jeremy Corbyn at the Labour leadership election a year ago found that for 57 per cent of them social media was a main source of news, as compared to around 40 per cent for the other candidates. Social and alternative media helped lead to the rise of Corbyn and changed the limits of ‘acceptable’ debate within the Labour party. The fact that you’re reading this means that alternative viewpoints can be sought out, read and shared. Please check out the alternative media above, share it, support it financially and/or become a member if you can. Or consider writing for – or even setting up your own – media co-operative.